Yay! Let´s make our own patterned papers! For my layout in the February gallery at WCS, I did just that and I thought I´d just show you real quick. Whenever I have a scrap piece of paper left after a project I use it to scribble stuff down on or doodle with my watercolors. This acctually came from just a doodle while I was bored one day! 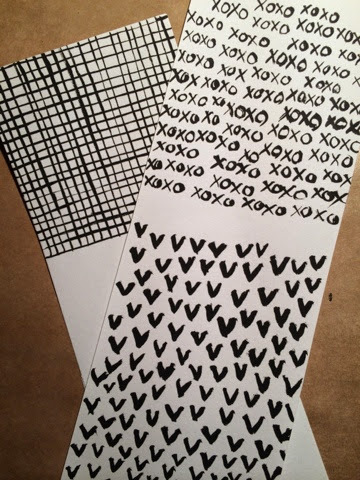 I used a very fine tip brush and my black watercolor and first made the xoxo pattern just randomly on the paper. I like how uneven and imperfect it looks, which is perfect since I am not a painter by any means! I then made the very simple heart patterned, which is basically a thick V.
The squares were a little bit more tricky, but I had the same philosophy here; make it perfectly imperfect! 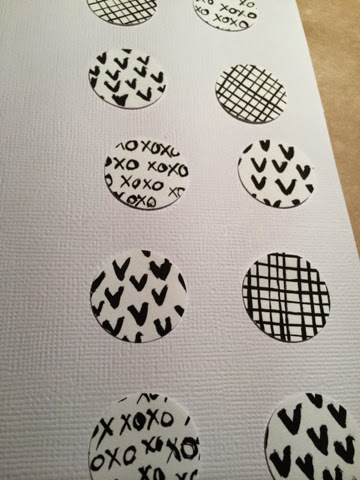 I then used my 1 inch circle punch to punch out the circles I then used for my layout. Easy peasy! Oh and wouldn´t this be a great way to use your kids artwork on a page?! I think yes! Last year I shared another easy way to use your watercolors to make scrapbooking supplies, go check that out too! After I made this and wrote this post, I did two more pages using watercolors to make the background. I will be back tomorrow with those! Hello everyone and welcome to Day 4 of our week devoted to learning new techniques! Sue here today, with a new technique I’ve been enjoying using on my scrapbook pages. Embossing paste adds an interesting dimension and texture to your cards and layouts. It is spread through a stencil to create a raised surface. I like the way embossing paste adds dimension without a lot of bulk. It’s a fun technique to learn. 1. Decide where you want your embossed image to go. Tape the stencil into place so it is flat to the page and will not move. Mask off any areas you do not want to emboss if necessary. 3. Carefully wipe off any surplus paste and return it to your jar of embossing paste. Remove the masking tape and carefully lift the stencil from the page. Clean your stencil and pallet knife right away to avoid the paste hardening on them! 4. Leave your page somewhere flat to dry. This could take anywhere from 20-40 minutes, depending on how thickly you have applied the embossing paste. This technique looks especially nice on dark paper, don’t you think? Another of my favorite looks is white-on-white. As a clean and simple scrapper, I love being able to add a few splatters while having complete control over where and how much goes on the page. If you decide to try this technique, there are plenty of examples on Pinterest. Allow yourself time to play with your embossing paste on scrap paper, or try it out on a card first. Give yourself permission to experiment. Who knows? 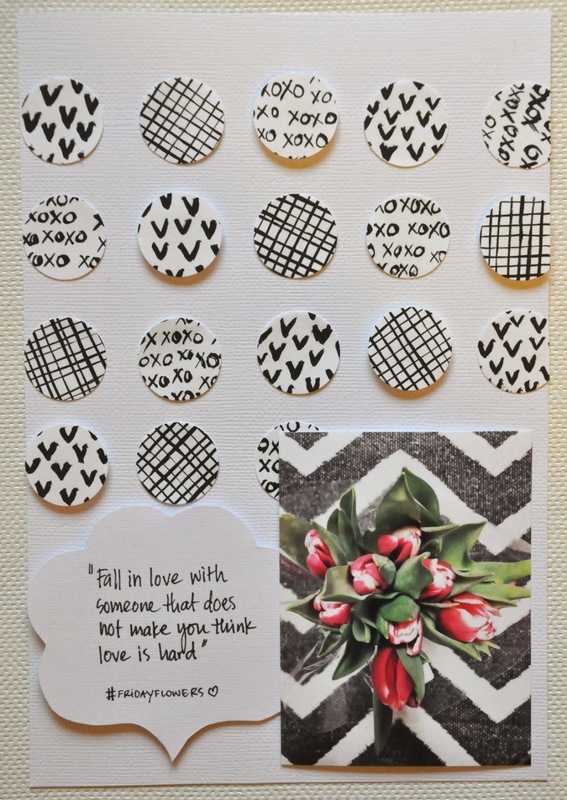 Embossing paste and stencils may become a new staple in your scrapping repertoire! Please come back tomorrow as we wrap up the week with a final new technique from Jenny Larson! Step One: Open a new file at 6 x 4 in., 300 dpi. Step Two: Open two photos and make any necessary edits. Crop each photo to 3 x 4 in., 300 dpi. Step Three: Using the Move Tool, drag the first 3 x 4 file onto the 6 x 4 file and move until aligned with the left edge. Step Four: Repeat Step Three using the second photo, but align with the right edge. Step Five: Save your file as a .jpg. Now it's ready to print at home or your favorite photo processor. Once your 6 x 4 file is printed, simply cut the smaller photos apart to use in your pocket page album, or on any project! The same steps will work for 2 x 3 in., 3 x 3 in., or any other small-sized photos - even mix and match sizes (such as one 3x4 with two 2x3 photos) to fit on a single standard 4 x 6 print. Here's a few examples: one pocket page and one 12x12 layout. Using smaller photos is a great way to get more photos on one layout! Happy Friday! Carey here to wrap up the week of sharing some quick digi tips. I hope you've had time to try some of the great tips shared so far. I've always used keyboard shortcuts in my workflow, no matter which program I'm using, including everything from spreadsheet, word processing and other programs at work to Photoshop Elements and Lightroom for my favorite hobby. Learning keyboard shortcuts for routine and frequently repeated commands certainly speeds up the process for me. Today, I'd like to share some keyboard shortcuts for Photoshop Elements, some of which are universal shortkeys, and point out some that are my favorites and most frequently used. The following image shows a variety of shortcuts using the Control (Ctrl) key (for Windows, or Command, Cmd, for Macs) plus a letter. I've included a few other select shortcuts as well. Ctrl + Z ...Undo: One of the BEST features of digital! These are just a selection of the wide variety of keyboard shortcuts available. I hope you'll give them a try and see how they can speed up your workflow! What are your favorite shortcuts? Hi Everyone! Christine here to kick off Digi Tips Week! Each day we will share a different simple digital scrapbooking tip with you. The tips are simple and easy, and bite-sized (or is it byte-sized, ha) so that you can jump right in and try it! Whether you are a seasoned digital veteran or a newbie, you can pick up tips to add to your digital scrapbooking repertoire. Today I'm going to show you a very simple way to color-in digital doodles. This tutorial will work in both Photoshop and Photoshop Elements. I'm using Kate Hadfield's Colour In Valentines as an example. You can use any digital line art or digital stamps/brushes. Here’s the before. The card comes as a black and white line drawing or doodle. And here’s after coloring using Photoshop. The whole process just takes about 3-4 minutes. The Photoshop/PSE tools that I'm using in the tutorial are the Eyedropper Tool (to sample colors) and the Paint Bucket Tool (to fill in the colors between the lines). If you want to use the color palette instead of using the Eyedropper Tool to sample colors, you can just click on any color in the color palette you would like to use. Watch the video below. If you wish to view it bigger, click here to go to Youtube. I hope you get an idea of how easy it is to color in digital doodles to match the colors of your digital layout or to print out for your crafting! Stay tuned the rest of the week for more Digi Tips!